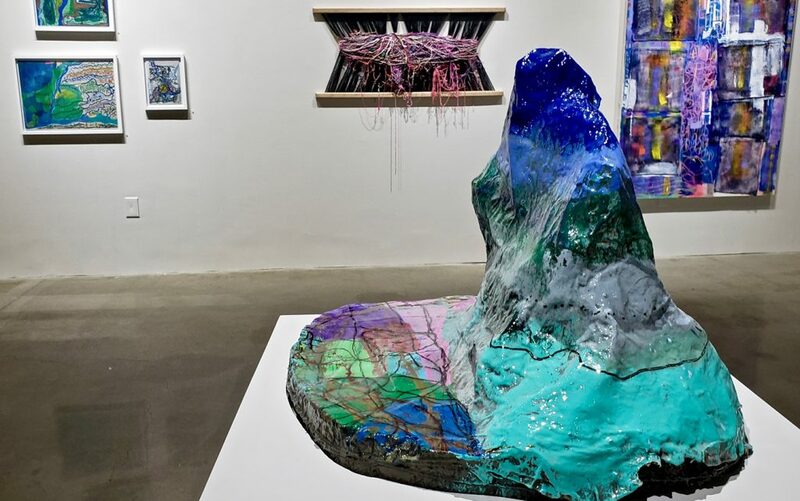 DETROIT — Mirror, Mirror at College for Creative Studies’ Center Galleries is a complex, engaging, and unique presentation of fully realized works by 14 artists who all exhibit extraordinary and singular visions. Curated by artist Anthony Marcellini in conjunction with Center Galleries Director Michelle Perron, the installation demonstrates the power of a keen curatorial hand in balancing a host of dramatic and dynamic works — each one given its own space, but situated with an eye for unexpected conversations across a range of bright colors and unconventional materials. Four pieces from Rachel Fallert’s Fingers series (2019) stand near the front of the installation space. These brightly colored forms made of painted papier-mâché over a wire framework could indeed be a set of uneven and muppet-like fingers, but they also recall a kind of cartoonish skyline, especially with Aislinn Wendrow’s “This is Sew Abstract!” (2019) in the background. The latter’s title presumably alludes to Wendrow’s recent practice of collaging her painted and repainted canvases with paper and tape elements using thick, colorful thread. Nearby, dramatic fiber pieces extend from the floor to the ceiling in the vaulted Center Galleries space. An incredible cascade of woven yarn by Stephanie Harris, titled “Muppets of Walt Disney World Orlando Florida” (2018), mirrors an equally tall net made from a rainbow of wire-strung beads by Alyssa Gold. This piece, titled “Beady” (2018), combines a brilliant mélange of prefabricated elements, punctuated by the occasional original bead handmade by Gold in glazed ceramic — tactile flourishes in the colorful, irregular mesh of the net. Gold hangs her nets as early as possible in her working process, valuing them as objects that she can hear and sense in her space — grids that tether her to the physical environment.